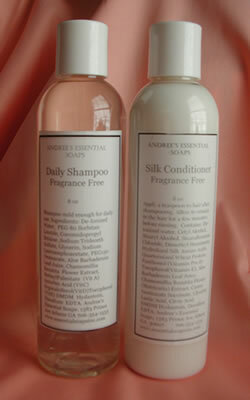 Andree's Essential Soaps, Athens, GA - your best source for sensitive skin products. Products from Andree's were featured in the Gala Gift bags at the Emmy Awards! Andree's famous essential oil hand cream, lemon verbena soaps and juicy pink grapefruitTM foaming bath salts made a guest appearance at the Emmy Awards...much to the delight of the 1200 guests from around the world! Andree's Essential Soaps: your source for natural handmade soaps and moisturizers using only the highest quality cold pressed oils of jojoba, grapeseed, avocado, olive, and shea butter.We offer a huge variety of fragrance free and essential oil products for cleansing, bathing, and moisturizing. Created for her mom after her skin became dry and sensitive following cancer treatment, Andree's Essential Soaps are used by and sold in hospitals for patients with sensitive skin, dry skin, psoriasis, lymphedema, and cancer. In 2004 Andree was also diagnosed with cancer and now has first hand experience with skin changes that can occur during chemotherapy and radiation treatment. Newly added to the line of products: a gift basket for the cancer survivor.Included in the basket: bath salts for bathing after chemotheraphy treatments or for relaxation, a shea and aloe moisturizer for use during radiation, and a lip balm for moisturizing the lips. Also try the bubble oil bombs... a coconut oil based hydrating bath product that bubbles and foams yet the tub stays clean...the skin feels like you have applied a light cream AND the house is filled with wonderful fragrance!